Here at Crawl Space Solutions of Arkansas, we've been fixing wet basements in neighborhoods like yours since 2008. Our certified technicians have the expertise you need to get the job done quickly, effectively, and permanently. There's no job too large or small -- and there's no wet basement we can't fix! 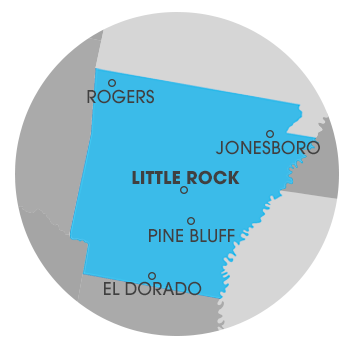 Let one of our basement experts come and give you a free waterproofing estimate in the Benton, North Little Rock, Little Rock, Jacksonville, Greenbrier, Maumelle, Sherwood, Alexander, Perryville, Bryant, Mabelvale, Hensley and the surrounding Arkansas area. We want to help you make your basement dry all the time! This basement had a serious water problem. To solve the problem of water sitting on the basement floor the crew installed a trench drain that runs along the perimeter of the basement and flows to the Super Sump and out of the basement. This basement had water damage on the bottom half of their dry wall. Crawl Space Solutions of Arkansas came in and cut out the effected dry wall, installing our basement wall panels in place of them. These products include sump pump systems and energy efficient dehumidifiers that are custom-designed to handle all problems that arise in below-grade spaces. Whether you live in Benton, North Little Rock, Little Rock, Jacksonville, Greenbrier, Maumelle, Sherwood, Alexander, Hensley, Bryant, Mabelvale, Perryville, our basement experts will show you how we can customize your waterproofing solution to keep the basement dry all the time! For a free, no-obligation waterproofing cost quote, contact us by phone or e-mail today!